Premier location. This 2 Bedroom/2 Bath penthouse condo is in the most requested location in the Crystal Sands complex because of the spectacular panoramic view. A million dollar view can be seen from each room. The unit sits directly on the water, and looking out, the ocean waves and Crescent Beach views are unsurpassed anywhere else on Siesta Key. Sunsets enjoyed nightly, plus postcard-like views from the bedroom windows, living room and 32 foot expansive lanai. Few other vacation complexes on this barrier island come as close to the water as this one. Let the waves serenade you, while you enjoy the white powdery sand on your private beach, complete with complimentary beach chairs. Or if a direct ocean-front pool is more to your liking, relax in your beach chair, while listening to the surf and sea gulls; at one of our two heated swimming pools. ***Newly remodeled** Ceramic tile and natural stone throughout, new bathrooms, new kitchen, granite countertops, crown molding, all high-end furnishings and accessories, PLUS opened up living room view with expanded floor to ceiling glass doors across entire living room. The condo is fully furnished to make your vacation carefree. Every convenience of home,including Calphalon pots & pans, beach towels, beach chairs/rafts/umbrellas, and a washer and dryer in the unit for your convenience. Also includes newest air conditioning technology with special filtration unit which kills mold, odors, bacteria and viruses from circulating air. The building complex offers two heated swimming pools, 3 elevators (one is glass enclosed with sky line views of the entire island), assigned covered parking, on-site maintenance and security for all entrances and pool area. This top-of-the-line condo has a million dollar view, plus the amenities and beach front accommodations of a 5 star resort. Minutes away is Siesta Village with its quaint shops and restaurants, or within a short drive is St. Armand’s Circle, an upscale area with trendy restaurants and shops situated next to Lido Beach. Or if you want to leave paradise for a short drive north, stop at any number of ocean front restaurants on your way to downtown Sarasota, home of the Ringling Museum, Marina Jack’s, or the many sidewalk cafes and pubs lining Main Street. However, at the end of the day, come back to your ocean retreat, because after all, it is all about the VIEW! Please note, there is currently construction occurring on the exterior lanais. Please check with owner on project status when booking. We love Siesta Key, the beautiful beach, white quartz sand, and year round great weather. Plus, we enjoy the quaint charm of Siesta Village's restaurants and shops, while riding bikes throughout the barrier island or a quick car ride to downtown Sarasota or St. Armand's Circle. The relaxed island atmosphere brought us back year after year, so we finally decided to buy a slice of paradise right on the beach. Now we can enjoy the beautiful sunsets from every room of our condo, or walk just steps to the beach or ocean front pool to enjoy beachfront living! Crystal Sands is located on the barrier island of Siesta Key in Sarasota Florida. Located on the Gulf of Mexico, the island is conveniently located approximately 15-20 minutes from the Sarasota (SRQ) airport, or one hour from Tampa (TPA) or Ft. Meyers (RSW). Families can also incorporate a Disney or Universal Studios trip, as it is an easy interstate drive of 2 hours to Crystal Sands. Crystal Sands is one of the few condominiums that is literally steps to the beach. Other complexes are set back much farther from the beach, look out over foliage or rooftops, and ours does not. Our penthouse 2Bed/2Bath unit has a view from every room, that few can match. 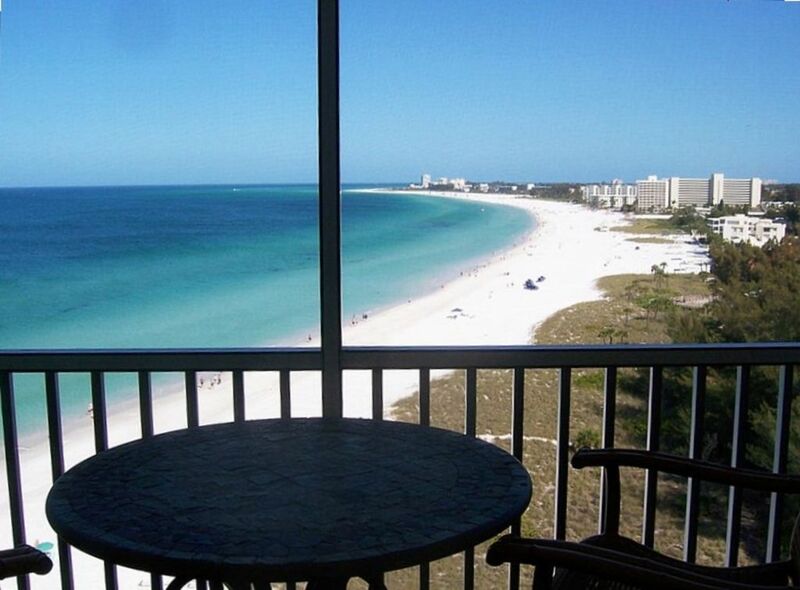 One can enjoy panoramic views of downtown Sarasota, ocean front sunsets or postcard views of Crescent Beach. The complex is also one of just a few that have an oceanfront pool. Rates are subject to change with reservations made greater than 8 months from arrival date. All cancellations are subject to $75 administrative fee. Guests agree to abide by Crystal Sands condominium rules (sent upon commencement of rental agreement) and Owner's unit rules. Keys and security info sent to guest 2 weeks prior to check-in. Additional waterfront properties available by this owner, see #573701.